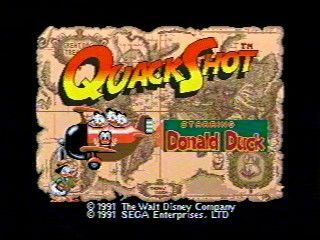 Released in 1991, QuackShot features Donald Duck in a treasure hunt adventure. One day, Donald discovers a map leading to King Garuzia's Great Duck Treasure. Stricken with dreams of being rich, Donald is determined to find the Great Duck Treasure, but will Big Bad Pete and his gang let him? Best time: 0:25:10 by 'Windalgo' on 2013-12-14. Shoutout to the MGO community for tricking me into believing I was good at videogames. A favorite game from my childhood. You play as a duck that has to go do the things. I make the duck go fast. -Shooting while on the ground forces you to remain stationary, so it's optimal to hop whenever you shoot. -Shooting raises your hitbox, allowing you to clear enemies and make certain jumps you couldn't normally. -Sliding doesn't work on slopes, though if you stand up as soon as you hit the slope you will retain your slide speed. You can buffer this by sliding back and forth, which is used in Egypt. -The duck has very odd hitboxes. Notably, the collision box is off center to the front, meaning you can push yourself into walls by jumping backwards. This is important for a major skip in the South Pole. There are two versions of this game, REV00 and REV01. I play on REV00 while the previous run by mike89 and the TAS both use REV01. There are only 2 differences that I'm aware of. One being in REV01 you are able to enter the temples (Mexico and Egypt) while the door slides open, in REV00 you have to wait for the door to fully open. The other is on the zip line at the start of the final temple, REV01 gives you various items including some corn shots and a turkey. Because REV00 doesn't have these, I have to refill my health earlier in the level. Neither of these cause substantial time losses. At the end of the first level (Mexico), I'm able to change directions the same frame as the level-end dialogue starts. This makes my duck retain the slide speed as he goes to plant the flag, saving a few frames. At the end of the second level (Duckburg), you see me change directions too early and lose a few frames. At the start of the third stage (Mexico) and early into the sixth stage (Maharajah), I'm able to jump over NPCs to skip dialogue. In the ninth stage (Viking Ship), you see me mess this up, though it costs barely any time overall. In the tenth level (South Pole) is the biggest skip in the game, and largest improvement over the previous run. By exploiting jump momentum and the weird duck collision boxes, you're able to push yourself far enough into the wall to knock out an ice block early. This allows you to enter the final section backwards, skipping the bulk of the section. The eleventh level (Hideout) is another large improvement over the previous run. The floating platforms section is much more optimized, saving a large amount of time, and in the following section is an exploit. Moving off an edge while holding down allows you to slide once midair. This lets you to skip a small section of this level. The final boss (King Garuzia) is a huge improvement, making use of an exploit not used in the TAS. Hitting King Garuzia while the screen is all the way to the left, before his sword is able to hit the wall, causes his sword to stop for long enough to defeat him in a single cycle. This works on both REV00 and REV01. Overall I am pleased with this run. The few mistakes are very minor, and I was able to get the South Pole skip within my first attempts. I hit all the smaller time saves, was able to goof around with some glitches, and in general the run was clean. I hope you enjoy duck games.